Please complete this form to send a message to Sadiq Khan and Zac Goldsmith, candidates for Mayor of London. You can either send this message as it is, or edit it before sending. 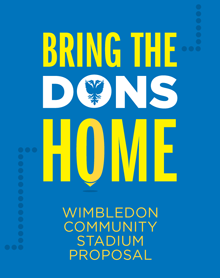 Bring the Dons Home is a campaign run by a group of Wimbledon fans who want to make the community stadium a reality. We believe that the community stadium will bring significant benefits to the wider community in SW19. You can contact us at info@bringthedonshome.org.